December weddings have a truly special vibe. Winter is a time for celebration and grandeur, and weddings tend to reflect that festive mood. We’ve prepared a quick guide to appropriate December wedding outfits for the new couple, and also for the guests. If you have decided to hold your wedding in December, it’s up to you to choose the mood and the level of formality. Are you envisioning a solemn and glittering event with traditional, detail-rich gowns? Or are you aiming for something dazzling and fun? You also get to decide the color scheme. 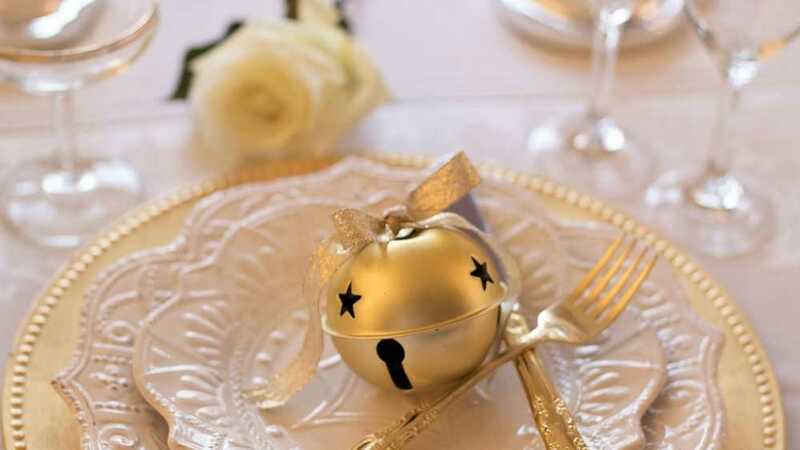 Winter weddings can be delicate, with pale gold décor. Or you can use jewel tones or dramatic red decorations, creating a festive event to rival any New Year’s Eve celebration. 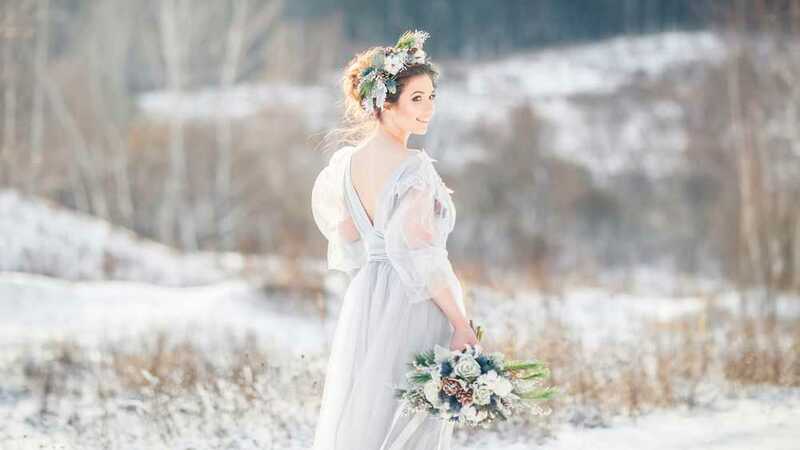 How do you decide on the best bridal outfit for your winter wedding? And what should the groom focus on when selecting an outfit? Will you spend the entire ceremony inside? If so, you can go for a light fabric that evokes cheery summer months. But most December brides prefer warmer fabrics. You’d choose a dress made of satin or velvet. Woven fabrics are gorgeous as well. Heavy, layered lace can also have a beautiful effect. If you are determined to wear a summer gown to your winter wedding, you can have alterationist add a satin lining. If you have chosen a simple and heavy fabric, you want to add some sparkles to lift the mood of your dress. You can go for crystal beading on the sleeves or bodice. Intricate embroidery is very appropriate too. Do you want to evoke a December mood? Choose a sleeved dress. If you dislike wearing close-fitting sleeves, you can go for a two-layered wedding dress. The bottom layer can be sleeveless, while the stop layer is airy and loose. First, winter weddings are perfect for elaborate jewelry and hair ornaments. While normally you want to make sure the jewelry doesn’t clash with the beading on your dress, you can put restraint aside this time. Go for large earrings or dramatic necklaces. The right jewelry can make people think of snowflakes and frostwork, whatever the weather outside might be. 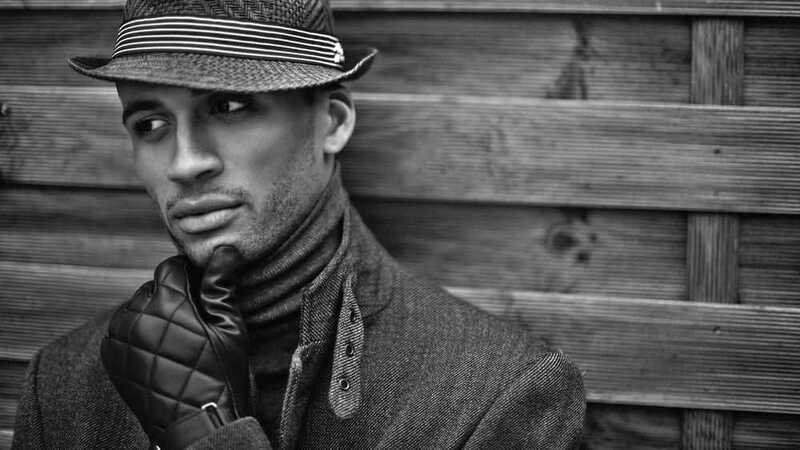 Secondly, you’d want accessories that will keep you warm while looking impressive. Gloves are a popular choice for brides who opt for short sleeves or sleeveless models. You should also consider coats. A fur stole can be an unforgettable finishing touch, and here you should go for deep, rich browns or grays. Some brides like to combine different styles, and your coat provides a perfect opportunity to do that. For example, you can choose a tailored leather jacket to complement your delicate dress. Choose Shoes That Fit the Weather. Suede or velvet bridal shoes are both warm and comfortable. Wedding booties can look whimsical or elegant, and there are many designs to choose from. Winter wedding boots are a controversial choice, but you may be able to find something in your style. If you prefer to add some color to your wedding dress, you’d want to make sure it fits the mood of your event. 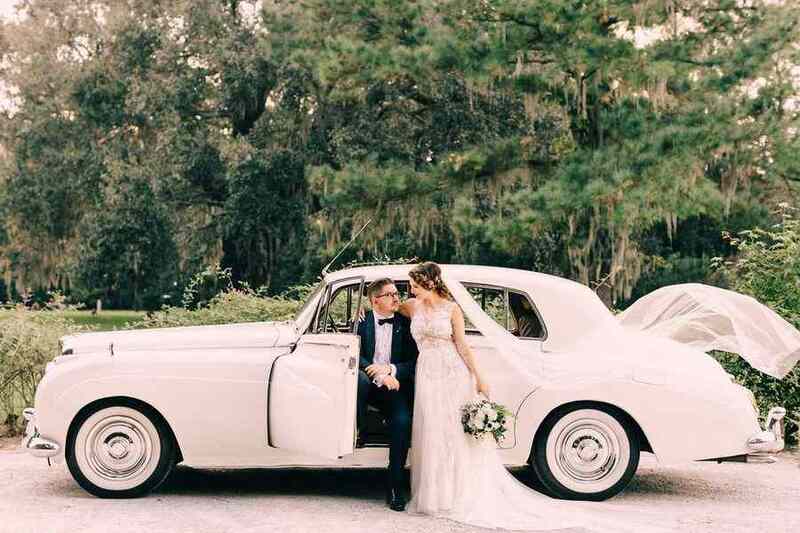 Some brides prefer luxurious champagne or silver hues. Others prefer to go for a rich purple, red, or teal. When it comes to the groom’s attire, elegance is the most important consideration. Black, navy, and charcoal suits are the most appropriate option for a December wedding. The groom can also go for lighter colors that match the décor. Combining dark suits with bright accessories can result in a very impressive outfit. There is a wide selection of winter-themed boutonnieres that he can choose. Grooms who want to look especially festive can go for accessories that evoke pine cones or berries. What about keeping warm? The groom can wear a cardigan or sweater while taking outdoor photographs. What to Wear If You’re Invited to a December Wedding? 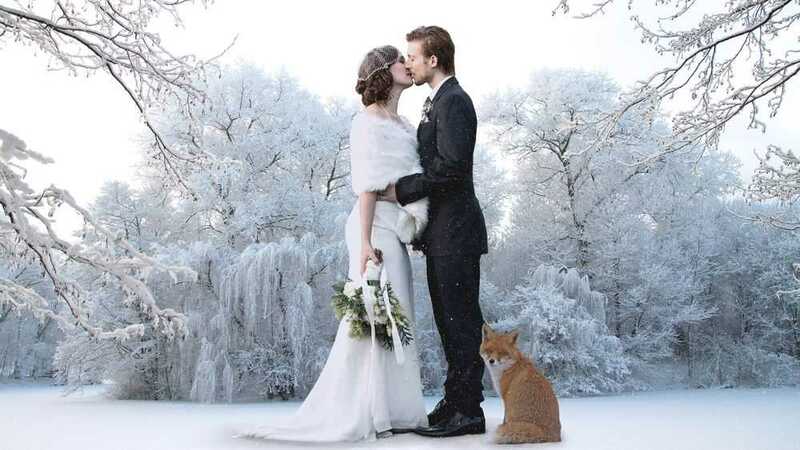 If you’re a guest attending a loved one’s winter wedding, you have a few important consideration. Your look has to match the event’s level of formality as well as your own taste and body type. If you’re attending a December wedding, you’d want heavier materials and warmer shoes. While you don’t want to outshine the bride, you can definitely make beaded velvet or decadent lace work. This is the best occasion to wear an elegant dress in dark blue or green. Make sure to choose jewelry that matches the tone of your dress. In case you’re wondering – it’s perfectly fine to wear black to a wedding, as long as you balance it out with the right accessories. Unless delicate pastel closely fits the theme of the wedding you’re attending, you should leave your pastel outfits for the summer season. Go for deep, warm colors. You can choose patterned dresses as well. You can wear long sleeves, or a combination of short sleeves and gloves. If you decide on a sleeveless cocktail gown, you should make sure to bring a bolero as well. A shawl can also be a good choice if you’re set on wearing short sleeves. For male wedding guests, suits are the safest choice. However, it’s important to avoid overdressing. Find out the expected level of formality before you go shopping. If the wedding is casual, you can go for a blazer. As December weddings are particularly festive, you can choose eye-catching accessories. Once again, winter-themed boutonnieres can be impressive and elegant. You can combine a navy suit and light blue tie to evoke a winter mood. Choosing the right coat, shoes, or gloves is half the fun of putting together your winter wedding outfit. Don’t hesitate to use layers. Above all else, you should focus on your own comfort, so you can enjoy the wedding without having to worry about anything.